Rebel is a standalone 50k word MC Romance set in the Boneyard Brotherhood Universe. When I joined the force after coming back from the sandbox, I didn't expect my day to day life would be anything but routine. It wasn't. I was barely more than a rookie when I was tapped to go undercover with some biker gang made up of other veterans... the "Boneyard Brotherhood" they called themselves. While my partner Tara posed as my "pretend girlfriend", we were tasked with finding evidence the sheriff could use to convict the members. It seemed easy enough. It wasn't though. Things soon got complicated, both at the Boneyard and between Tara and me. I had feelings for both. The members of the brotherhood had become just that, brothers and I wanted to drop the "pretend" from my status with Tara. But it was only a matter of time before the Boneyard found out I was a plant, and I was going to get stung. 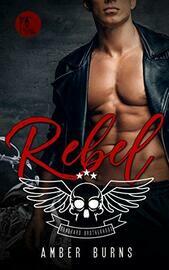 The Kindle Edition of Rebel Includes a FREE copy of Rowan for a limited time!